WITS professor and deputy director of the Wits Institute for Social and Economic Research (WISER) Keith Breckenridge has claimed the prize of the Humanities Book Award for his book on the biometric state. Breckenridge’s book was chosen among 58 entries for the acclaimed award presented last week. “The book is an argument that there is a distinctive form of government called biometric administration and that that is when your whole state, at all its levels, is organised around a single, central, biometric identification,” said Breckenridge. “Biometrics means, in this case, fingerprinting,” he said. 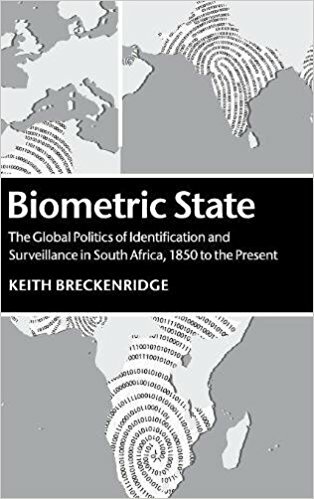 Breckenridge’s book titled Biometric State: The Global Politics of Identification and Surveillance in South Africa, 1850 to the Present won first prize in the bi-annual competition for the best book in the humanities and social sciences. He described the road to the prize as “pretty simple”. “I didn’t have to defend the book. The book did that all by itself,” said Breckenridge. He is currently working on another book about biometric capitalism which he hopes to finish by the end of 2017. He describes his main motivation for writing his award-winning book as one to “insist on the international significance of the South African experiment”. Breckenridge admits that the current readership of the book consists of academics and researchers who can afford to pay for the $110 hard-back version. He is aware of a pirate version of the book which is freely available on the internet and mainly read by graduate students all over the world. “The number of people that have actually paid for the book is tiny but the number of people that have read the book is very large. It’s one of these typical 21st century dilemmas,” said Breckenridge. Although he did not make the pirated version of the book, Breckenridge is not particularly bothered by its existence. “I think all books should be free. I’m not sure that academics should be making more money, on top of what they earn anyway,” he said. The subject matter of the book is very specific, appealing to a certain type of audience, but the award has brought new attention to Breckenridge’s work. “Before I started writing on this it was pretty unusual for anybody to write anything about this outside of Europe and the United States,” said Breckenridge.